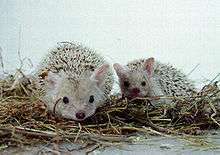 A hedgehog is any of the spiny mammals of the subfamily Erinaceinae, in the order Eulipotyphla. There are seventeen species of hedgehog in five genera, found through parts of Europe, Asia, and Africa, and in New Zealand by introduction. 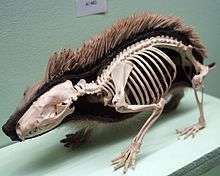 There are no hedgehogs native to Australia, and no living species native to the Americas (the extinct genus Amphechinus was once present in North America). Hedgehogs share distant ancestry with shrews (family Soricidae), with gymnures possibly being the intermediate link, and have changed little over the last 15 million years. Like many of the first mammals, they have adapted to a nocturnal way of life. 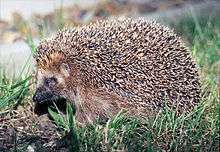 Hedgehogs' spiny protection resembles that of the unrelated porcupines, which are rodents, and echidnas, a type of monotreme. A defense that all species of hedgehogs possess is the ability to roll into a tight ball, causing all of the spines to point outwards. Since the effectiveness of this strategy depends on the number of spines, some desert hedgehogs that evolved to carry less weight are more likely to flee or even attack, ramming an intruder with the spines; rolling into a spiny ball is for those species a last resort. The various species are prey to different predators: while forest hedgehogs are prey primarily to birds (especially owls) and ferrets, smaller species like the long-eared hedgehog are prey to foxes, wolves, and mongooses. Hedgehogs are primarily nocturnal, though some species can also be active during the day. Hedgehogs sleep for a large portion of the day under bush, grass, or rock, or most often in dens dug in the ground, with varying habits among the species. All wild hedgehogs can hibernate, though not all do, depending on temperature, species, and abundance of food. 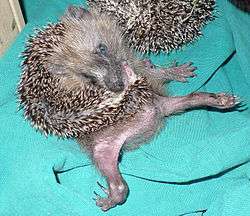 The hedgehog's back contains two large muscles that control the position of the quills. The average hedgehog has about 5,000 to 6,500 quills that are strong on the outer surface but filled with air pockets on the inside. When the creature is rolled into a ball, the quills on the back protect the tucked head, feet, and belly, which are not quilled. This is the hedgehog's last but most successful form of defense. The olfactory regions have not been thoroughly studied in the hedgehog. In mammals, the olfactory part of the brain is covered by neopallium, therefore making it difficult to expose. This difficulty is not impossible, as it varies from one species to another. Tests have suggested that hedgehogs share the same electrical activity as cats. It is illegal to own a hedgehog as a pet in some US states and some Canadian municipalities, and breeding licenses are required. No such restrictions exist in most European countries with the exception of Scandinavia. In Italy, it is illegal to keep wild hedgehogs as pets. Philip Larkin, who turned down Poet Laureate-ship and is the late 20th century's best-known English poet, wrote one of his most quoted poems on the death of a hedgehog, "The Mower." 1 2 Hutterer, R. (2005). "Order Erinaceomorpha". In Wilson, D.E. ; Reeder, D.M. Mammal Species of the World: A Taxonomic and Geographic Reference (3rd ed.). Johns Hopkins University Press. pp. 212–217. ISBN 978-0-8018-8221-0. OCLC 62265494. ↑ Reiter C, Gould GC (1998). "Thirteen Ways of Looking at a Hedgehog". Natural History. 107 (6): 52. ↑ "WildlifeTrust.org.uk". WildlifeTrust.org.uk. Retrieved 2013-02-28. ↑ Oxford English Dictionary, Online edition. Retrieved 13 July 2007. 1 2 3 Attenborough, David (2014). Attenborough's Natural Curiosities 2. Armoured Animals. UKTV. ↑ Omori-Satoha, Tamotsu; Yoshio Yamakawab; Dietrich Mebs (November 2000). "The antihemorrhagic factor, erinacin, from the European hedgehog (Erinaceus europaeus), a metalloprotease inhibitor of large molecular size possessing ficolin/opsonin P35 lectin domains". Toxicon. 38 (11): 1561–80. doi:10.1016/S0041-0101(00)00090-8. PMID 10775756. ↑ Drabeck, D.H.; Dean, A.M.; Jansa, S.A. (June 1, 2015). "Why the honey badger don't care: Convergent evolution of venom-targeted nicotinic acetylcholine receptors in mammals that survive venomous snake bites.". Toxicon. Elsevier. 99: 68–72. doi:10.1016/j.toxicon.2015.03.007. ↑ Adrian, E. D. (1942). "Olfactory reactions in the brain of the hedgehog". The Journal of Physiology. Cambridge: The Physiological Laboratory. 100 (4): 459–473. doi:10.1113/jphysiol.1942.sp003955 (inactive 2016-06-27). PMC 1393326 . PMID 16991539. ↑ Suomalainen, Paavo; Sarajas, Samuli (1951-08-01). "Heart-beat of the Hibernating Hedgehog". Nature. 168 (4266): 211. Bibcode:1951Natur.168..211S. doi:10.1038/168211b0. ISSN 0028-0836. PMID 14875055. ↑ "The Hedghogz Home Page – Babies & Reproduction". Hedghogz.co.uk. Retrieved 2009-03-08. ↑ "Fauna selvativa e specie protette". Corpo Forestale dello Stato. Retrieved 31 August 2014. 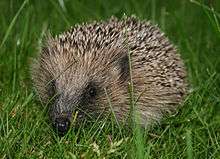 ↑ "Hedgehogs pose prickly problem for native fauna". Landcare Research media release. 17 September 2003. Archived from the original on 2003-10-01. Retrieved 6 December 2011. ↑ Ross, David (14 January 2009). "18 Trappers Sought for Hebrides to Protect Birds from Hedgehogs". The Herald. Retrieved 12 June 2009. ↑ "List of Hedgehog diseases". Wildlifeinformation.org. Archived from the original on 26 July 2010. Retrieved 2009-03-08. ↑ Takahashi, Yoko; Ayako Sano; Kayoko Takizawa; Kazutaka Fukushima; Makoto Miyaji; Kazuko Nishimura (2003). "The epidemiology and mating behavior of Arthroderma benhamiae var. erinacei in household four-toed hedgehogs (Atelerix albiventris) in Japan" (PDF). Japanese Journal of Medical Mycology. 44 (1): 31–8. doi:10.3314/jjmm.44.31. PMID 12590257. ↑ Haigh, Amy; O'Riordan, Ruth M.; Butler, Fidelma (2014). "Hedgehog Erinaceus europaeus mortality on Irish roads". Wildlife Biology. 20 (3): 155–160. doi:10.2981/wlb.12126. ↑ Lean, Geoffrey (2006-09-09). "Hedgehogs saved from death by McFlurry". The Independent. London. Retrieved 2016-07-20. ↑ "A community for African Pygmy Hedgehog Owners and Breeders – Environmental Enrichment". Hedgehog World. Archived from the original on 2008-01-15. Retrieved 2009-03-08. ↑ Pidd, Helen (14 September 2007). "Roast hedgehog and nettle pud – a slap-up feast for ancient Britons". The Guardian. London. Retrieved 12 June 2009. ↑ Qumsiyeh, Mazin B. (1996). Mammals of the Holy Land. Texas Tech UP. p. 64. ISBN 978-0-89672-364-1. ↑ Nijman, V.; Bergin, D. (2015). "Trade in hedgehogs (Mammalia: Erinaceidae) in Morocco, with an overview of their trade for medicinal purposes throughout Africa and Eurasia". Journal of Threatened Taxa. 7 (5): 7131–7137. doi:10.11609/JoTT.o4271.7131-7. ↑ Wood, Manfri Frederick (1979). In the Life of a Romany Gypsy. J.A. Brune. pp. 80–81. ISBN 978-0-7100-0197-9. ↑ "Potato Crisps – A History". BBC. 7 December 2002. Retrieved 22 March 2010. ↑ Henning, B.D., ed. (1983). "ONSLOW, Sir Richard (1601–64), of West Clandon, Surr. and Arundell House, The Strand, Westminster". The History of Parliament: the House of Commons 1660–1690. Boydell and Brewer.